Intelligencerthe money June 30, 2015 8:00 a.m. The ride-sharing service used to be recognized as the anti-Uber. Now the boundaries aren&rsquo;t so clear. Minutes later, a Subaru arrived, driven by a grizzled documentary filmmaker, with a silent young woman with swooping bangs and chipped nail polish in the back seat. After hopping in the front, Zimmer asked Larry how long he had been driving with Lyft, engaging in some secret-shopper-style market research. (Larry did not realize Zimmer is Lyft’s president.) “Just about four weeks. So, I’m a newbie,” Larry responded. We Asked 10 Black-Car Drivers If They Prefer Working for Lyft or Uber — Here's Why Lyft Won By a Landslide How One Woman Could Destroy Uber’s Business Model — and Take the Entire ‘On-Demand’ Economy Down With It Will the New Concierge Economy Mean the End of the Errand? “Was there a difference in the passenger experience?” Zimmer asked, his tone a Californian meld of earnestness and nerdery. Zimmer flashed a smile at the answer. 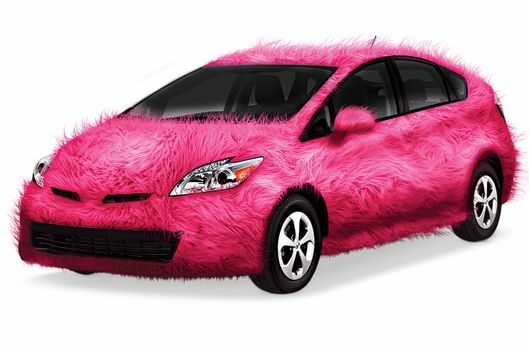 The company he built is the pink, fuzzy alternative to black, sleek Uber. Its founding tagline is “Your Friend With a Car,” whereas Uber’s is “Everyone’s Private Driver.” Lyft prides itself on providing a friendly, even fun service, rather than a silent luxury ride, and on building a community of drivers and passengers. To date, Uber has raised more than $5 billion and is valued at around $50 billion. Approaching an expected mega public offering, it is known to be one of the most aggressively successful start-ups to have emerged in the postrecession era. Lyft has raised $1 billion and is worth about $2.5 billion. Though it is headed toward profitability, it is still spending large sums to attract drivers and passengers. At the same time, Uber is spending even larger sums in an effort to become an on-demand logistics and transportation behemoth, in part by eroding Lyft’s driver and customer base. Can Lyft survive as No. 2? What could make it No. 1? Or should it become a different product altogether? Those are the kinds of existential questions being hashed out in Lyft’s San Francisco headquarters, and among investors wondering whether to bet on the underdog. To better compete, Lyft is adding new services, refining its image, trying to position itself as the more lovable brand for riders and drivers. It has swelled to over 450 employees, with executives hired from Google, Virgin America, Netflix, and Facebook. It just raised a small war chest of its own, including $100 million from the infamous activist investor Carl Icahn. “There’s a secular change going on, particularly with respect to urbanization,” Icahn told me, “and that creates tremendous potential for Lyft. There’s room for two, maybe three competitors in the area.” Icahn could be right: The economy may be changing fast enough, and the marketplace may be large enough, for a company that embraces Silicon Valley’s most utopian impulses to thrive against the most megalomaniacal of competitors. Some Lyft investors are careful not to describe their company as second to anyone. “We would never invest if we thought the company was destined to be No. 2 in the space,” says Andreessen Horowitz’s Scott Weiss, who sits on Lyft’s board. Tech start-ups are often terrified of being No. 2 in part because of what economists call “network effects”: The bigger company might keep getting bigger, just because it is bigger. It helps to explain the monopoly-like dominance of Amazon, Google, Facebook, and perhaps, one day, Uber. More users on Uber means more drivers on Uber means shorter wait times on Uber means more users on Uber. And so Lyft is trying very hard to convince you that it offers a fundamentally different ride. Kalanick and his co-founder, Garrett Camp, dreamed up Uber after they found themselves stuck in Paris, unable to hail a taxi. Lyft took its inspiration from the ingenuity of the impoverished people of Zimbabwe. In 2005, Zimmer’s co-founder, Logan Green, traveled there as a college student at the University of California, Santa Barbara. He found that, instead of a taxi service with meters, lights, and dispatchers, Zimbabweans had created an informal shuttle economy: Your friend with a microbus would pick up you and some others and drop you off for a fee. “It was this resource-sharing born out of necessity,” Zimmer told me, walking the warehouse-dotted blocks of Lyft’s neighborhood with an iced coffee in hand. At the time, Zimmer was studying hotel administration at Cornell and having an opposite epiphany about American resource use. “A hotel is considered a failure if it has less than a 60 percent occupancy rate, and yet there are all these cars driving around with a 20 percent occupancy rate,” he said. Most Americans, when they drive, drive alone. At the same time, about 30 miles north in San Francisco, Kalanick and Camp were thinking about American vehicular resources along the same lines as Zimmer. Black cars often sat idle. Why not make a smartphone app to put them to use, letting riders hail them for short hauls at a cut rate? That service, of course, became Uber, which launched in San Francisco in 2010 and scaled up frighteningly fast, quickly hitting a million rides. Zimride was a more modest success — its rides measured in the thousands. In part inspired by Uber, in part nudged by the new ubiquity of smartphones, Zimmer and Green decided to try to facilitate on-demand short trips via Zimride too with a product called Zimride Instant. Rebranded as Lyft, it launched in San Francisco in 2012, and by the next year they had sold the original, long-haul concept to Enterprise, the rental-car company. At the beginning, Lyft was easily recognized as the anti-Uber. I remember a close friend — a free-love, hug-everyone resident of the Mission — telling me about it for the first time. A random person with a car would come get you. You’d recognize the car by the giant pink mustache attached to the grill. You’d hop in the front seat. You’d fist-bump the driver. You’d go where you needed to go. At the end, you’d leave a “donation” to cover the cost of the trip. To help average Americans get over the perceived danger of getting in a car with a stranger, Zimmer and Green contemplated making the service all-female. “Our girlfriends and female employees counseled against it,” he said. The hyperfriendly pink branding stuck. As both companies flourished in San Francisco, their business models rapidly converged. Uber announced Uber X, with lower-priced fares; like Lyft, it lets anyone apply to be a driver. By early 2014, Lyft had ditched the donation model for set pricing, like Uber’s. They both started offering carpooling services to attract commuters and people taking taxis to and from airports. Later that year, Lyft let its passengers know that it was fine to sit in the back. Now, in many markets, Lyft and Uber can feel identical. Lots of drivers use both and make roughly the same amount. (Lyft and Uber both normally take a 20 percent commission; Lyft drivers can receive tips through the app, though not all passengers leave one.) Many passengers ride with both, and in many cities, the pricing, wait times, and user experience are comparable. For instance, coming into San Francisco from the airport, I hailed a car with the Uber app, waited a few minutes, and sat in the back when my car arrived. The ride was with a driver named George. We chatted a little. I dozed off at some point. This cost $37.62. Headed back to the airport, I took a ride with a Lyft driver named Victor. The drive was a bit longer, and the fee a bit heftier because of “prime time” pricing, Lyft’s equivalent of Uber’s “surge” pricing. I sat in the back. We chatted a little. I dozed off at some point. This cost $49.20. While our conversation with Larry and Amanda may have highlighted the Lyft difference, another ride Zimmer and I took, with a former taxi driver who now works for both Lyft and Uber, highlighted the opposite. “I have both apps running at the same time, so I just take whatever’s closer to me or whatever makes sense,” he said. “Do the experiences seem similar to you? Is there any difference?” Zimmer asked hopefully. “Lyft are a little more friendly in general. Uber is a little more quieter, professional types,” he responded. The battle between the two companies has gotten brutal, bitter, even a little juvenile. Last year, a Lyft analysis allegedly showed that Uber employees had requested and canceled some 5,560 rides on Lyft, annoying drivers and delaying rides for thousands of other passengers. (Uber has denied the allegation — and claims Lyft has done the same to it. Which Lyft denies.) The website The Verge revealed that in an operation code-named SLOG, Uber gave independent contractors burner iPhones and company credit cards. The contractors would request Lyft rides and then attempt to recruit the driver to the black side once in the car. (“We can’t successfully recruit drivers without talking to them — and that means taking a ride,” Uber responded.) 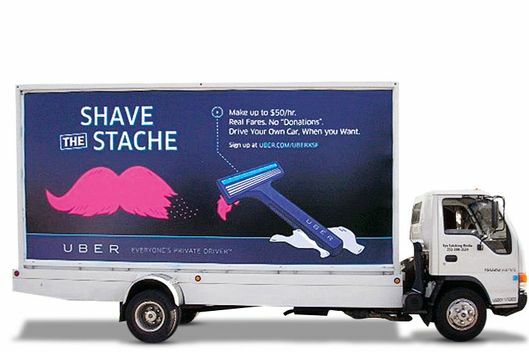 At one point, Uber put out mobile billboards in San Francisco reading SHAVE THE STACHE — a reference to Lyft’s iconic pink mustache. 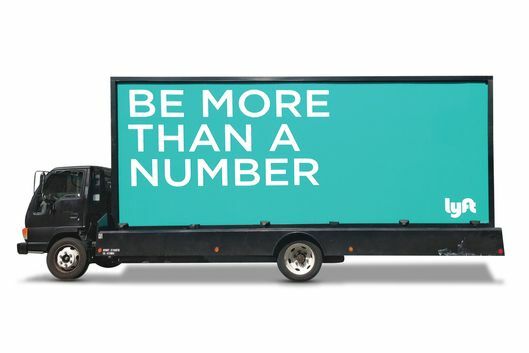 Lyft later parked a huge teal BE MORE THAN A NUMBER billboard outside Uber’s office. Both companies have been forced to shell out millions of dollars to win over passengers and, crucially, drivers. A service’s success in a given city depends deeply on whether rides are available when riders start requesting them; nobody wants to wait 20 minutes for a car. To ensure that supply, in certain cities and periods Lyft offers up to $750 in cash to new drivers and guarantees them $1,200 a week. Uber also pays hefty recruitment and referral fees and $500 bonuses to drivers who worked with another ride-sharing platform and switched over. All those handouts to drivers and passengers add up. Lyft is profitable in its more mature markets, like San Francisco, the company says. But in many other cities it is not. TechCrunch recently reported that the company expects to spend $150 million signing up new passengers and $50 million signing up new drivers. And though the company’s expansion has been touted as a success — it has gone from serving one market to serving 65 and reportedly expects to double its revenue in 2016 — there have been missteps. Unlike Uber, which had contentiously but successfully moved into the New York market by licensing its drivers with the Taxi and Limousine Commission, Lyft pressed ahead last summer without doing so. New York’s public officials did not take kindly to the decision. “As it has done in every other city in which it operates, [the] defendant has simply waltzed into New York and set up shop while defying every law passed whose very purpose is to protect the People of the State of New York,” the attorney general’s office declared. “Despite being warned and told to cease and desist by three separate regulatory and enforcement agencies, defendant has thumbed its nose at the law and continued with its plan to launch in what could become its largest market.” A weeks-long standoff was ultimately resolved when Lyft agreed to do what Uber had done. Now Lyft in New York offers an essentially identical service to Uber’s, if with fewer drivers. Ford and General Motors. American and United. Target and Walmart. The great American consumer market is full of examples of rivalries that nudged businesses to innovate, drop prices, and refine their goods and services. Sometimes those rivalries are fairly evenly matched, but often they are not. Remember Hertz and Avis? Back in the early 1960s, also-ran Avis — a smaller, less successful business than Hertz — decided to run a new advertising campaign, one that embraced its market position rather than trying to change it. “When you’re only No. 2, you try harder. Or else,” the company’s advertisements read. Avis’s initial business insight was to locate its cars at airports, not in downtowns, but its most ingenious one was to play up its inferior position. It focused on its newer fleet and better customer service, promising, “We’re always emptying ashtrays,” and “Since we’re not the big fish, you won’t feel like a sardine when you come to our counter.” The strategy worked: The company moved from the red to the black and expanded its market share — even, within a few years, coming close to beating Hertz. In the company’s converted-warehouse headquarters in the Mission, there are row after row of sitting-standing desks, a hidden Downton Abbey–style parlor accessible by pushing on a large, gold-framed painting, and a dining room where employees enjoy a hot-cooked lunch at communal tables. Upstairs, in an airy studio blocked off by a barn door, Jesse McMillin, Lyft’s first creative director, pondered that broader vision. At Virgin America, that magic included bold red branding, decent enough Wi-Fi, and the guarantee of touchscreen-enabled televisions at every seat, including the squished ones in the way back. It also included some smart marketing, like a safety video McMillin oversaw that went viral. The strategy has shown results: Virgin America topped Consumer Reports’ 2013 airlines rankings. On the other hand, when was the last time a viral safety video persuaded you to pay for an airline ticket? And Lyft faces challenges unique to its position as tech disrupter. It does not own its fleet of cars, unlike Virgin, which owns its fleet of planes. Moreover, it legally cannot dictate much about the passenger’s experience within the car. Lyft’s entire business model is predicated on its drivers’ being independent contractors, not employees. Granted, those drivers appear to like working for Lyft better than for Uber. As of this spring, according to Campbell, the smaller company paid better in 42 markets, with Uber shelling out more in eight. And Campbell says Lyft’s friendliness is even more attractive. “At the end of the day, when you’re doing something like ten, 20, 30 hours a week, you want it to feel as little like a job as you can,” he says. But the more control Lyft exerts, the stronger the legal argument those drivers have that they aren’t simply freelancers relying on an app. Several lawsuits are already pressing for Uber, Lyft, and a number of other on-demand economy businesses to reclassify their independent contractors as employees — a move that could force the companies to supply workers with health benefits, unemployment insurance, workers’ compensation, and reimbursement for expenses, as well as pay the employer portion of the payroll tax. In a sign of where that fight might be headed, the California Labor Commission just ordered Uber to pay restitution to a driver it redefined as an employee — a decision Uber is currently appealing. Given the delicate legal environment, Lyft has only a few ways to enhance the Lyft experience: the app, the branding, and the corporate culture. It puts an extraordinary amount of effort into building a community of drivers and passengers — throwing parties, launching a “perks” program, following its drivers on social media. It encourages them to develop a little quirk, like handing out cookies to passengers or having costumes in the car to take selfies with. On the app, the company has added social features to help passengers and drivers get to know each other. Zimmer, for instance, knew that Larry was from the East Coast when he hopped in his Subaru. Lyft has also placed a major emphasis on customer support, safety, and being a more desirable option for women. Unusually among tech firms, nearly half of Lyft’s top executives are women, as well as more than half of its riders and a third of its San Francisco drivers. Lyft has a large safety team and guarantees that you can get a human being on the phone if something has gone wrong. It’s possible that Uber might one day decide to try to crush Lyft once and for all by dropping its prices for riders and paying out bonuses to drivers. Or that Uber won’t even have to, because of the brutality of network effects in disruptive consumer tech products. But it’s also possible that … well, anything’s possible. Zimmer told me that the company’s goal is for everyone who owns a car to have Lyft installed on their smartphone and to get signed up as a driver. “Anybody with a car is a driver,” he repeated, as did no fewer than five other people there. Perhaps the 1099 economy will come crashing down, and when everyone’s drivers are reclassified as employees, the playing field will be leveled. Perhaps Uber will collapse from its own weight. Perhaps there really is a multibillion-dollar ride-sharing economy being born. Icahn invested not for any inventive initiative schemed up by McMillin’s team, or because he thinks there’s much purchase in the utopian transportation system of Zimbabwe. He invested because, in his mind, there is room for two modestly differentiated but ultimately substitutable services, especially when one company is 20 times cheaper to invest in. “It’s a transportation service,” he said. “You have multiple airlines, multiple cruise lines. And all of those companies have differentiated themselves over time. To have only one player in this space just doesn’t sound logical to me.” No one in Silicon Valley wants to admit they’re in second place — but sometimes you don’t have to. Simply being No. 2 might be enough.